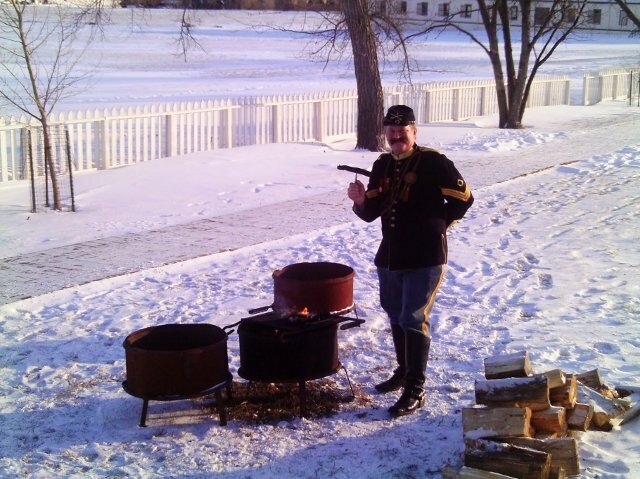 At Fort Abraham Lincoln State Park, the year is 1875. Soldiers in historic uniforms still drill on the parade grounds and army laundresses still hang the wash out to dry in the prairie wind. The reconstructed frontier fort commemorates the last home of General George A. Custer. Montana may go down in history as the place where Custer died, but North Dakota is the place where Custer lived. 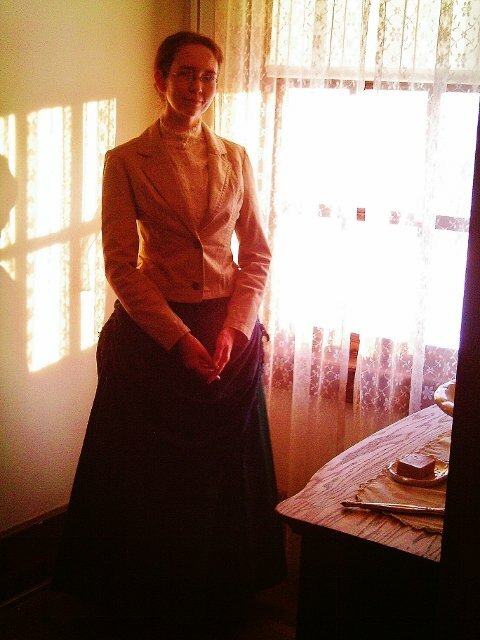 I’ve been doing living history re-enactments at this site for the past twelve seasons. (I call your attention to the above-mentioned laundresses.) 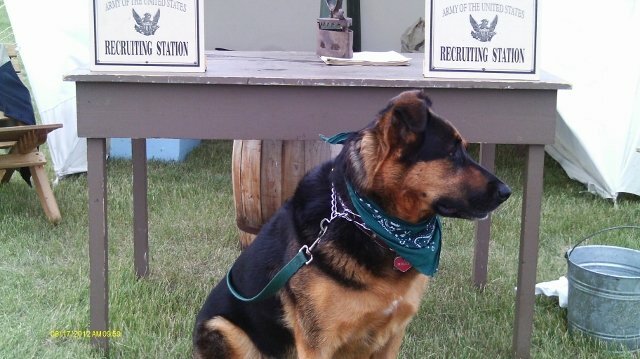 And when Molly came into my life … why, she signed right up. Fort Lincoln grows quiet when the snows come in. But it wakes up again for one weekend in December. 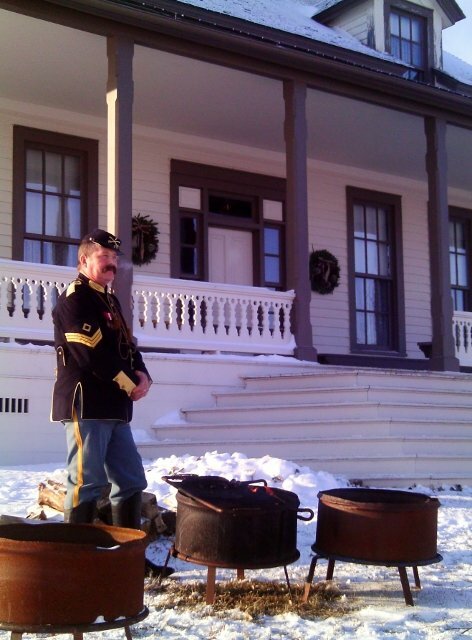 My favorite Christmas event–anywhere–is Custer Christmas. 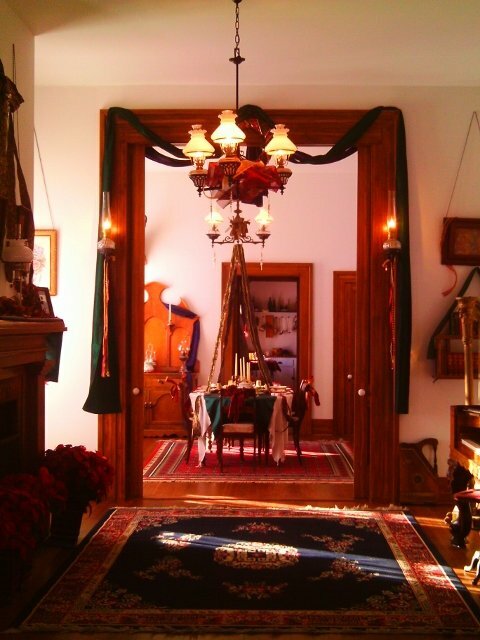 The Custer House is decorated for a frontier Victorian Christmas, visitors are welcome to string popcorn and frost cookies, the kids can build all sorts of old-fashioned crafts, and the house is full of caroling musicians–such as yours truly. Did I ever mention I play a banjo? 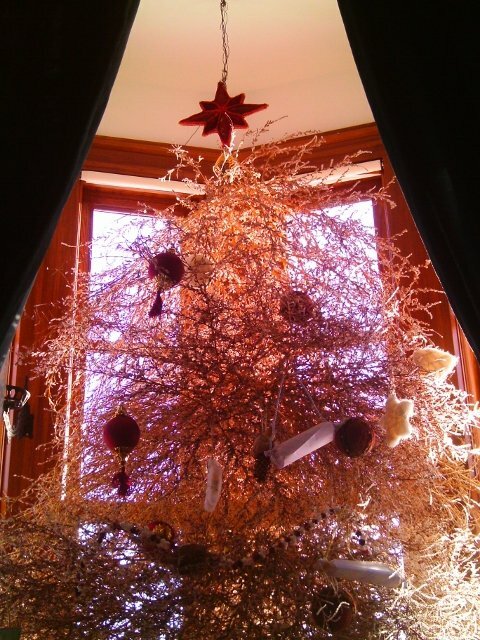 The rare tumbleweed Christmas tree. True story: A detachment of soldiers sent out to find a Christmas tree discovered that evergreens don’t grown in northern Dakota Territory. So they came back with tumbleweeds. It’s been some pretty blue Christmases the past few years because Custer Christmas was canceled. Attendance had been scanty, and it seemed pretty certain the event was retired for good. 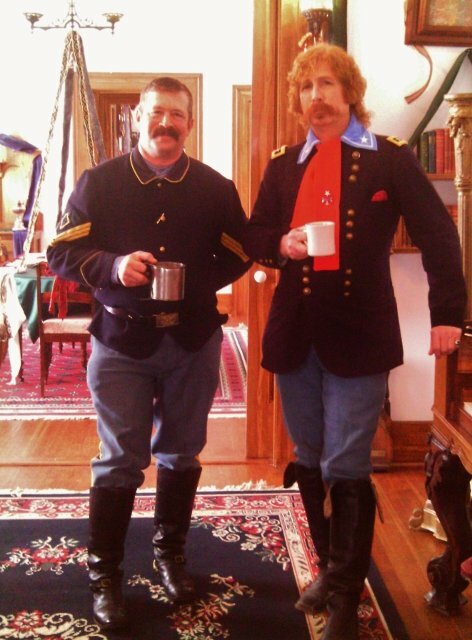 But at the tail-end of November this year, I heard Custer Christmas was back on. It was the best present ever. The morning of the event, it was a frigid ten below zero. I rolled out of bed, grabbed my already-packed period attire and the banjo, threw everything into the car, and turned the key. Something told me an extension cord for my block heater would have made a lot of difference. I’d just moved to a new apartment in a small town, and an extension cord was one of the things I didn’t have yet. There was an auto parts store a few blocks away. I pulled on my heavy gloves and jogged down the ice-covered streets. Bought an extension cord. Ran home. Wouldn’t you know? The cord was barely too short. Jogged back to the auto store. Bought a longer cord. Ran home again. Did I mention it was ten below? I spent the next two hours trying to coax my engine to life. 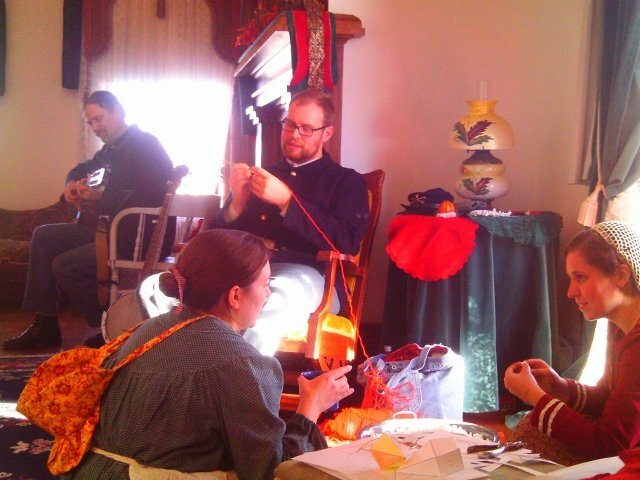 Two, long, torturous hours, while I knew all my friends were down at the Fort, caroling and telling stories and laughing. In that temperature, in a small town this quiet, I would have frozen before anybody drove by. So I tried a different tactic. I decided to knock door-to-door in my apartment building until I found somebody with a jumper cable. You’d never guess. Turns out two rednecks with a pickup live right across the hall from me. In a matter of five minutes, they jumped my car. How does Nancy know these things? 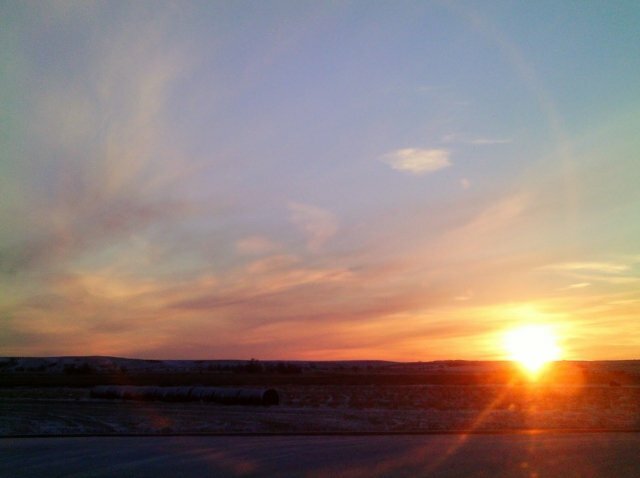 Finally I was on my way to Custer Christmas. I arrived about four hours late, but I made it! (My eternal gratitude to Nancy and my new redneck neighbors.) The rest of the afternoon and the next day were filled with music, dancing, and Christmas spirit. But in the back of my mind I did find myself asking, What possessed me to work so hard for this? 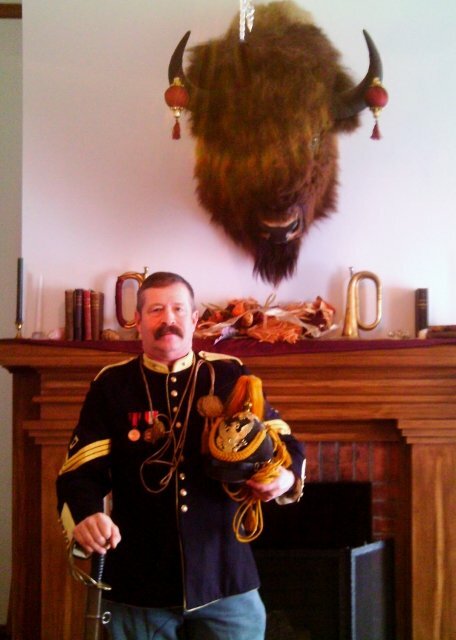 Our Christmas celebration wouldn’t be complete without our host, General Custer. I’ll be the first to admit–that was a lot of work to get to an event. Why couldn’t I just let it go? My usual stubborn determination to achieve a goal certainly played in. But I think First Sergeant Johnson said it best while we were shivering outside eating sausage fresh off the campfire. Steaming-hot sausage on a frigid day. Mmmm. He looked across the parade ground. The Fort was so quiet, buried in snow. The smoke from the campfires smelled warm and reminded me of summer camping. But the spicy steam from the sausages almost froze as it curled through the air. Down on the banks of the Missouri, flocks of Canada geese came in for a landing. The geese talking was the only sound. “Doesn’t this just recharge you?” the First Sergeant asked. It seems none of us can escape a certain level of monotony in life. But we can take a weekend to pursue something meaningful. Enjoying the silence of a winterscape. Experiencing the simple pleasures of a by-gone era. Freezing your fingers eating sausage with a friend at ten below zero. Another good reason to fight every obstacle to make it to Fort Lincoln. Custer Christmas 1875 (it’s always 1875) was the year the General danced the Virginia Reel with a group of re-enactors and tourists. I strummed at my banjo till the strings almost ripped, and First Sergeant Johnson jumped in with his fiddle. I died and went to Fezziwig’s, it was that much fun. This is the kind of stuff that recharges me. These are the moments I live for and will always remember. Yes, it was worth all the work. The perfect end to a perfect day. See the full photo album! Like Molly and me on Facebook. Get our latest blog post straight to your email. We’re Back! Lots of Big News!